Darrin Pochan, professor of materials science and engineering, has been named a fellow of the American Physical Society. 2:43 p.m., Feb. 29, 2012--Darrin Pochan, professor of materials science and engineering at the University of Delaware, has been named a fellow of the American Physical Society (APS). The fellowship recognizes individuals who help advance physics through original and independent research. Membership as an APS Fellow distinguishes Pochan among the top one-half percent of all APS members. “Darrin is an excellent scholar and educator and his scientific impact has been extensive and highly admired,” remarked David C. Martin, Karl W. and Renate Böer Professor and chair of the Department of Materials Science and Engineering (MSEG), who nominated Pochan. Pochan’s expertise is in developing new nanostructures and functional materials through the assembly of soft materials like polymers and proteins. These new materials, Pochan said, can be designed to have biomedical applications in drug therapy or tissue regeneration. For example, assembled hydrogel biomaterials can serve as drug therapy delivery agents or matrices for the regeneration of diseased tissue in the body. “The potential of hydrogels to impact cancer treatment, in particular, is great for both the local delivery of chemotherapeutic drugs to a tumor site as well as for tissue regeneration after a cancer tumor has been removed,” he explained. “Working on the nanoscale, we are controlling and fine-tuning the nanostructure of these materials to enhance the desired effect in biological systems." Martin noted that Pochan is an “integral member of the MSEG faculty,” and has made significant contributions to the department, most notably with the establishment and equipment of the University’s W. M. Keck Electron Microscopy laboratory. He is also a dedicated teacher who values the contributions of his students, particularly those graduate students who have conducted research with him. “To be considered on the same list that contains many people I admire, and from whom I’ve learned so much, is an incredible honor," Pochan said. "The APS fellowship is also a testament to [my students'] hard work and creativity while performing research with me." Pochan said he views the collaborative atmosphere at UD as “one of the things that makes great research possible.” As federal research funding becomes increasingly difficult to come by, however, he noted that advanced research still faces challenges. “Great research is only possible with solid financial backing. Support for increased federal funding of advanced research in the U.S. is critical, not only for the future of research at UD, but for society as a whole through the training of a capable workforce with answers to intractable environmental, energy and health care problems,” he said. Pochan will be inducted into the 2012 Class of Fellows during the APS national meeting in Boston, which is being held through March 2. 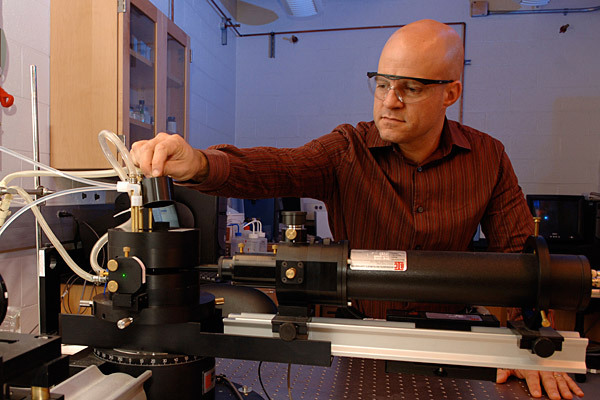 Prior to joining the UD faculty in 1999, Pochan earned a bachelor’s degree in chemistry from the University of Wisconsin Madison. He also holds master’s degree and doctorate in polymer science and engineering from the University of Massachusetts Amherst. His past career honors include a National Science Foundation Faculty Early Career Development Award, the DuPont Young Faculty Award, a Royal Society of Chemistry Fellowship, and the Dillon Medal, also from APS. He is an active member of APS, American Chemical Society, Materials Research Society and the Neutron Scattering Society of America. Pochan also works as the North American editor for Soft Matter journal.